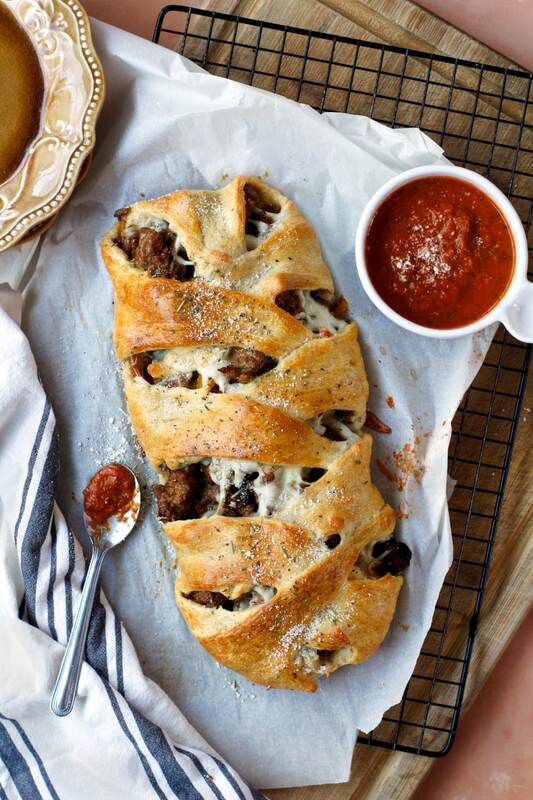 This Italian Sausage Crescent Braid is loaded with sausage, mozzarella cheese, and veggies all wrapped in a golden crescent roll crust. It bakes in just 15 minutes, making it the perfect choice for a weeknight dinner! 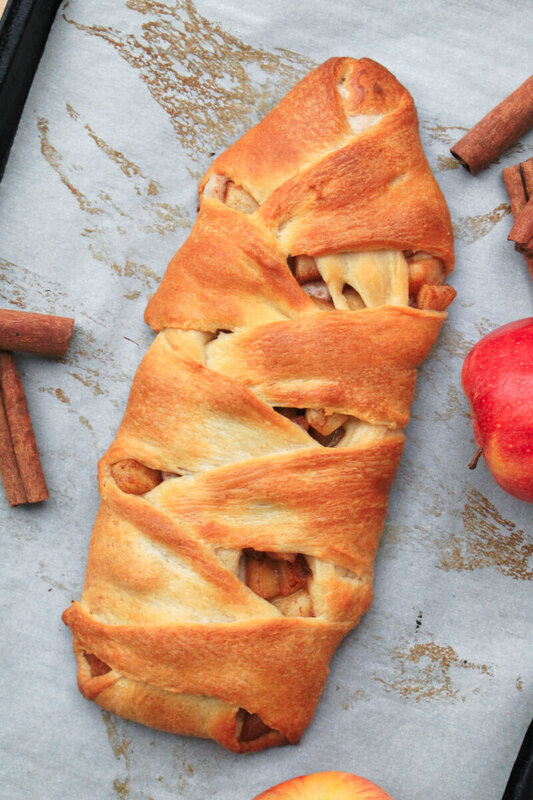 Crescent rolls have become one of my favorite things to incorporate into our dinners. Not in the usual 'roll and bake' way, though. More like the 'unroll and braid' way. 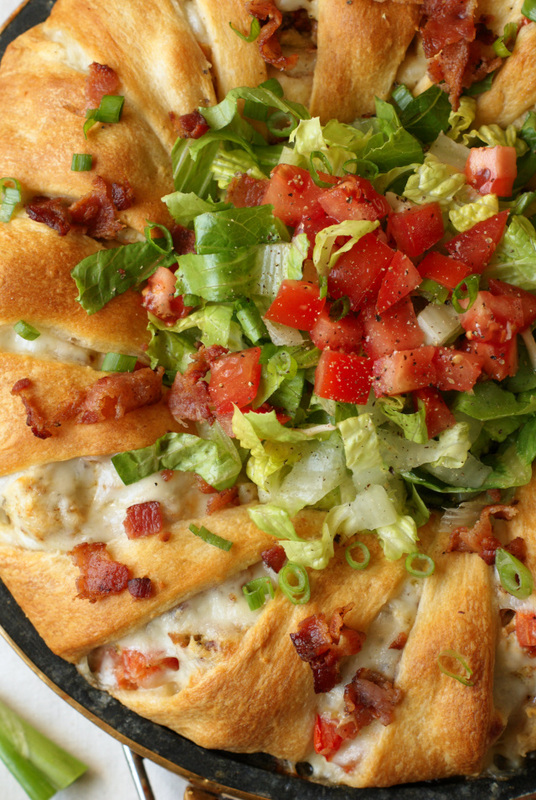 I love to use crescent rolls as a crust for all kinds of yummy fillings. You see, when you line your crescent rolls up on a baking sheet just right, you can fold the rolls over the filling and make a super pretty (and tasty!) braid. Surely, you've seen this before. However, if you haven't, I welcome you to the world of thinking outside the crescent roll box! I've got quite a few recipes here on the blog that use crescent rolls like this (see some of the links a bit further down in this post), and I think I'll likely be sharing more over time because the filling possibilities are literally endless! Think breakfast braids, vegetarian braids, or even dessert braids. I even made a Spinach Dip Stuffed Crescent Roll Christmas Tree one year! Seriously, crescent rolls are the base of some delicious creations that have come out of my kitchen. 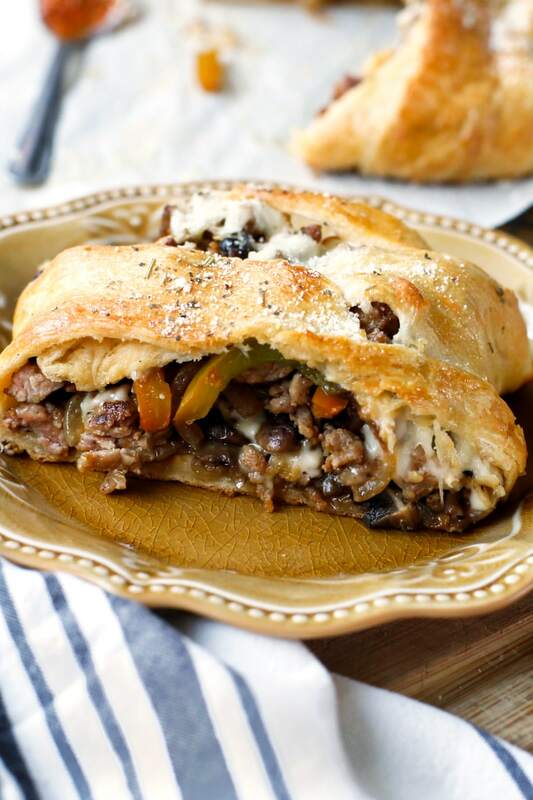 For this crescent roll braid, I went with one of our favorite combos: sausage, peppers, and onions! This time I went ahead and added some mushrooms to the mix because I really wanted to load this baby up with veggies to balance out the rich Italian sausage. Naturally, the sausage mixture needed some cheese to bind it all together, so I layered some mozzarella with the filling. You could easily use cheddar or provolone, but we like the stringy deliciousness of mozzarella with our sausage, peppers, and onions. 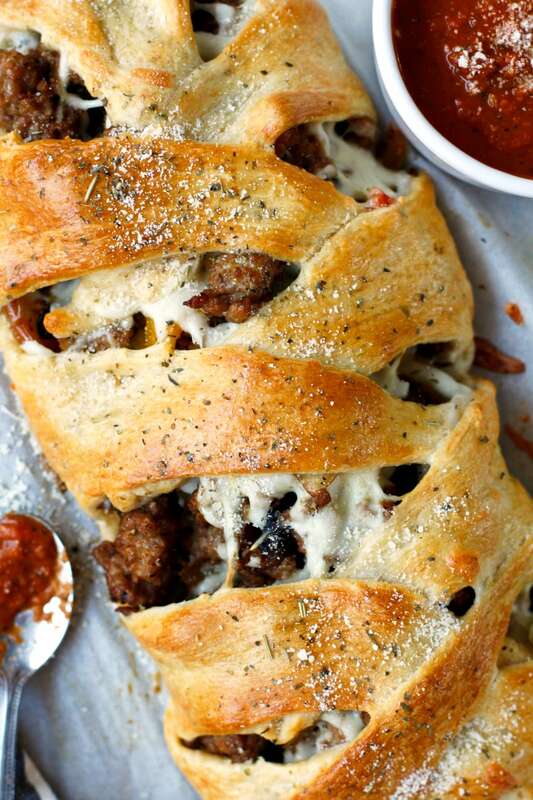 You can serve this Italian Sausage crescent Braid as is or top it with some warmed marinara sauce. Add a nice side salad and you've got a complete meal the whole family will love! 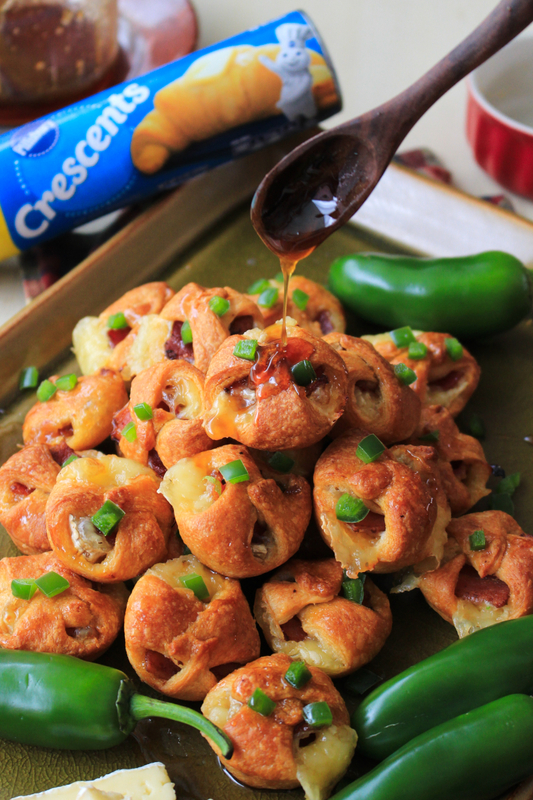 If you want to try this recipe as an appetizer, that could totally work, too! Just bake and then slice the pieces a bit thinner than you would if you are serving it as a meal. I hope you love this easy dinner recipe as much as we did. If you try it, I'd love to know what you think in the comments below! Enjoy! 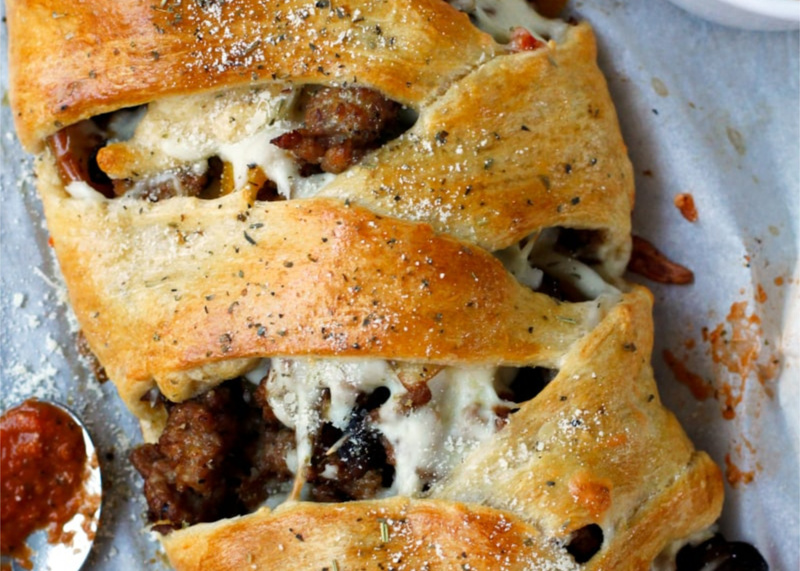 This Italian Sausage Crescent Braid is loaded with sausage, mozzarella cheese, and veggies all wrapped in a golden crescent roll crust. 2. Heat the olive oil in a large skillet. Add the mushrooms to the hot oil and season with salt and pepper. Cook for 3 minutes, stirring occasionally. 3. Add the onions and peppers to the pan and continue cooking for another 3 minutes, stirring occasionally. 4. Add the sausage to the pan and cook until crumbled and no longer pink. Remove the skillet from the heat and set aside to cool while you prepare the crescent rolls. 5. Line a baking sheet with parchment paper. Unroll the crescent dough and separate into 16 pre-cut triangles. Arrange the crescent rolls on the cookie sheet with the wide edges of each triangle overlapping in the middle, 8 crescent rolls on each side of the pan. Pinch the seam together in the middle. 6. Spoon half of the sausage mixture down the center of the crescent rolls. Top with half of the shredded cheese and then repeat. Fold the crescent rolls over the filling, alternating from side to side to form the braid. Bake in the preheated oven for 15 minutes. Let sit for 5 minutes before slicing. I used a combination of red, orange, and green bell peppers. To make the egg wash, whisk 1 egg with a splash of water. 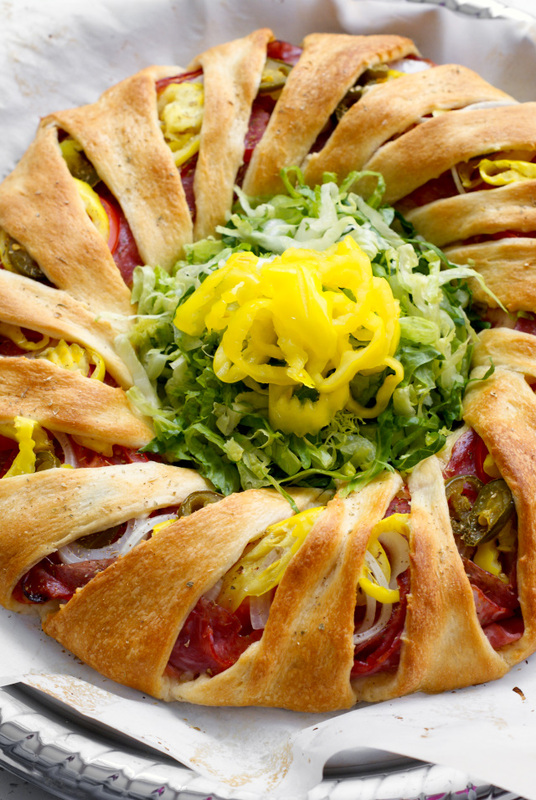 If you want to serve this as an appetizer, I recommend using an extra roll of crescent rolls to make the braid. As is, it is a fork and knife meal. With extra crescent rolls, the filling would be more spread out and it can be served as a finger food. Fantastic Post! This is very helpful information provided for food lovers. Thanks for sharing this post.